Brindella is standing in a meadow looking up at two birds. The birds are frozen mid-flight and of a yellow so bright it looks manufactured. The grass smells of paint, as does the fairy godmother whose mouth is open but not making any sound. None of this surprises Brindella, of course, for she knows she is in a storybook. They are on page 4 and the fairy godmother has just granted her a wish. Brindella hopes on page 5 to find out what she wishes for. She has already imagined all sorts of things—a library with a tutor to teach her to read and write, or maybe a horse with wings that could take her to England or even China! If I could just turn the page and see what’s next, she thinks. Brindella looks around and sees that the book is in a large room on a table next to some pens and paint brushes. She walks to the edge of the book and jumps down onto the table. Perhaps I could just take a quick peek. In her tiny hands she takes the corner of page four and raises it enough to see the page underneath, but there is only a big white space with some black lines and swirls at the top. No pictures. She sighs, knowing she will have to wait. Soon the door swings open, and a man in a T-shirt and jeans holding a paintbrush, walks in. He must be the one who drew her, who made the forest green and the birds yellow. Surely he knows the rest of the story. She puts her hands back on the book and pushes herself up, hoping to get close enough for him to hear. “Hello up there! Excuse me, please!” she hollers up at him. The man, named Mark, turns and smiles at her. “Uh-huh,” she says, nodding her head and waiting. “What else happens?” Brindella waits again, looking up at Mark, her eyes pleading. “Well, what happens after that?” she asks. “Then I’ll rewrite it,” Brindella says. Brindella looks at the pen on the table, as big as a tree trunk. Maybe if she stood it on end and held it with both hands . . .Then she remembers that she doesn’t know how to write. 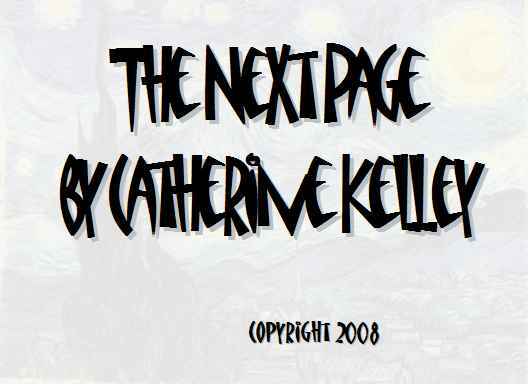 Copyright 2008, Catherine Kelley. © This work is protected under the U.S. copyright laws. It may not be reproduced, reprinted, reused, or altered without the expressed written permission of the author. Over the past ten years Catherine Kelley has taught English as a second language in both East Asia and the Middle East. She received her MFA from Goddard College in 2005. While studying there she discovered that she likes to write in short forms and rarely writes anything more than three pages.